Investors should be going global right now. Here are the stocks that show why. It is a well-known fact that the portfolios of many Australian investors are not geographically diversified. In recent years, some investors have used passive funds to provide access to global markets. Noting the current US equity bull market recently passed its ninth anniversary, increasingly opportunities exist in identifying individual stocks with compelling business characteristics rather than riding the vagaries of entire markets. With strong economic tailwinds for corporate earnings and mispricing opportunities arising from volatility associated with fears around the pace of interest rate increases, the US holds a range of opportunities. One particularly interesting company is Sensata Technologies. Sensata manufactures sensors for automotive, heavy vehicle and other industrial applications. Key drivers for the business are mandates for cleaner and more efficient vehicles, modernization of the fleet in China and further automation and electrification of vehicles. Japan is gradually emerging from the two “lost” decades. Japan’s economy has experienced a persistent lack of inflation, low growth and suffered from the challenges of an ageing population and high public debt. 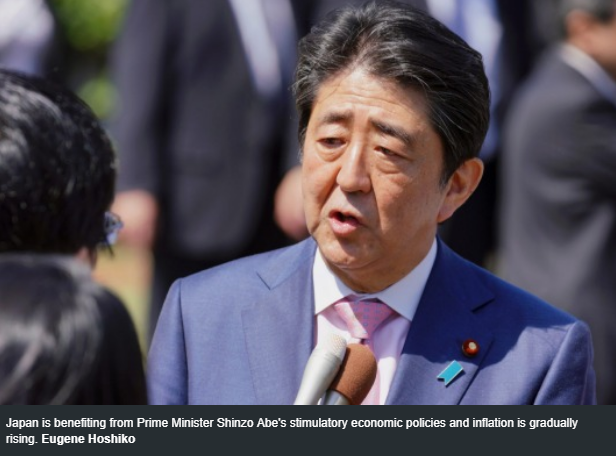 While the overall economic picture is mixed, the country is benefiting from Prime Minister Shinzo Abe’s stimulatory economic policies and inflation is gradually picking up. A significant positive development, and a dramatic change from the past, is that domestic shareholders are increasingly willing to put pressure on company management if their returns are not satisfactory. Green shoots are most obvious in the major cities such as Tokyo, Osaka and Kyoto, where net migration is positive and further stimulation will come in the form of infrastructure and tourism spend associated with the 2019 Rugby World Cup and 2020 Olympics.